A family-run estate that makes wines that will tantalize the nostrils with its amazing aromatics and ignite the taste buds – realty set them on fire! The roots run deep at this domaine with the new crew of winemakers representing the 6th generation of winemakers (in love with the land, as they claim). The winery is located in St Maurice de Satonnay, a small village in between Mâcon and Cluny. The winery has 41 hectares of vines spread over three communes: St Maurice de Satonnay, Péronne et Azé. The vines are planted on the hillside (some in the middle of the slope and others higher up.) The soil is clay-limestone with great South/Southwest exposure. The grapes used for the wines are Chardonnay, Pinot noir, Gamay and Aligoté. The wines made by the winery are: Macon Rouge, Bourogne Rouge, Borgogne Passetoutgrains Macon Villages, Macon Blanc, Cremand de Bourgogne. 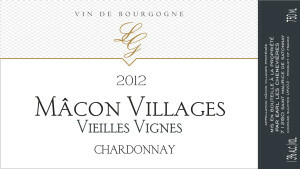 As of now, Golden Vines carries two different Macon whites and a Macon Rouge. However, we will most likely carry more as this winery makes great wine. There is a great balance between the old and the new here; tradition and modernity. There is a respect of the traditional methods of vilification but an acceptance of new oenological method (pneumatic press, controlling the temperatures during the alcoholic fermentation) this balance enables them to preserve the typicity and quality of the wines made. Additionally, each parcel is vinified separately allowing the winemaker to optimize the assemblage before bottling. Concerned for the environment, the winery respects the practices of sustainable farming – by the way it works the soil and the limited us of effluents. 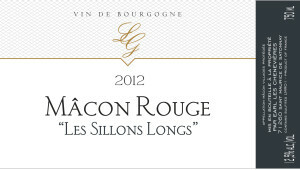 Macon Rouge "Les Sillons Longs"
The wine : This is the classic French bistro wine. The type of wine that beautifully accompanies your food, and every time you look down your glass is empty. This medium-body, yet hearty wine is made from 40+ year old Gamay vines and is a real crowd-pleaser, very easy-drinking. The wine has subtle notes of cherry, and raspberry with a little pepperiness on the finish. 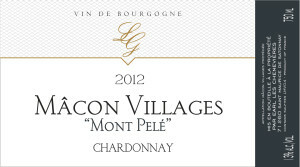 The wine comes from a relatively large parcel of land that is very well exposed, on a nice slope. This helps in making a beautiful dry white wine that is very aromatic, possessing great fruit. Tasting Notes: When young it is fresh, and aromatic, the wine is zippy and refreshing, with nice acidity, it’s energetic with citrus notes. The flavors soften and harmonize as the wines ages.